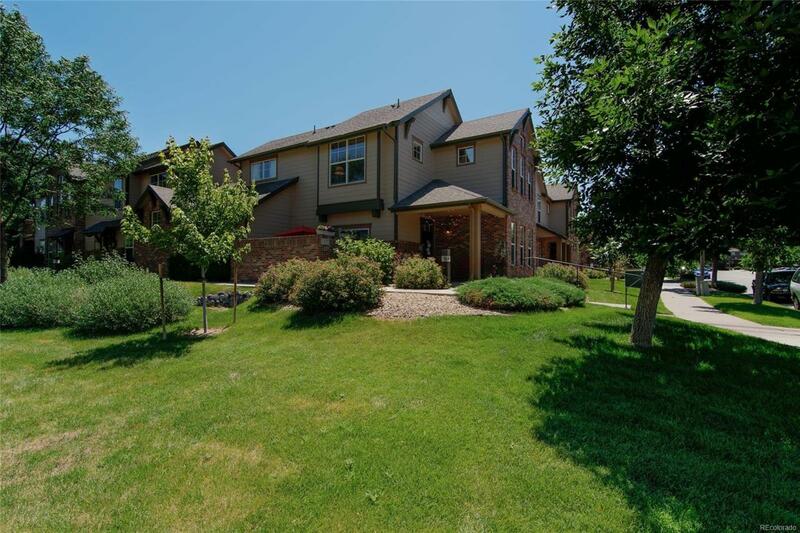 JUST STEPS AWAY FROM HEATHER RIDGE GOLF COURSE! BEAUTIFUL END UNIT W/ PRIVATE PATIO! This Immaculate Home Features Large Eat-In Kitchen w/ Spacious Quartz Counters, Maple Cabinets and Newer Tile Floor, Pantry, And Large Newer Kitchen Sink with Serving Bar. Vaulted Living/Dining Combo With Gas Fireplace. New Carpet. Beautiful Master Suite w/Vaulted Ceilings And Large Windows. Enjoy complete convenience with Upper Level Laundry main floor 1/2 Bath and main floor entry from 2 Car attached garage. 150 sq ft. Gated Patio and Large 132 sq ft Covered Front Porch for Summer Enjoyment. The best feature is Complete privacy as no one live above or below you and 2 car garage separates you from the neighbors! Water and Sewer are included in the HOA monthly fees!!! Located near all the amenities, light rail and public bus service. Only minutes to Buckley Air Base and Local Major Hospitals! Easy Commute! Don't Miss Out! This One Is A Real Find! Call today!